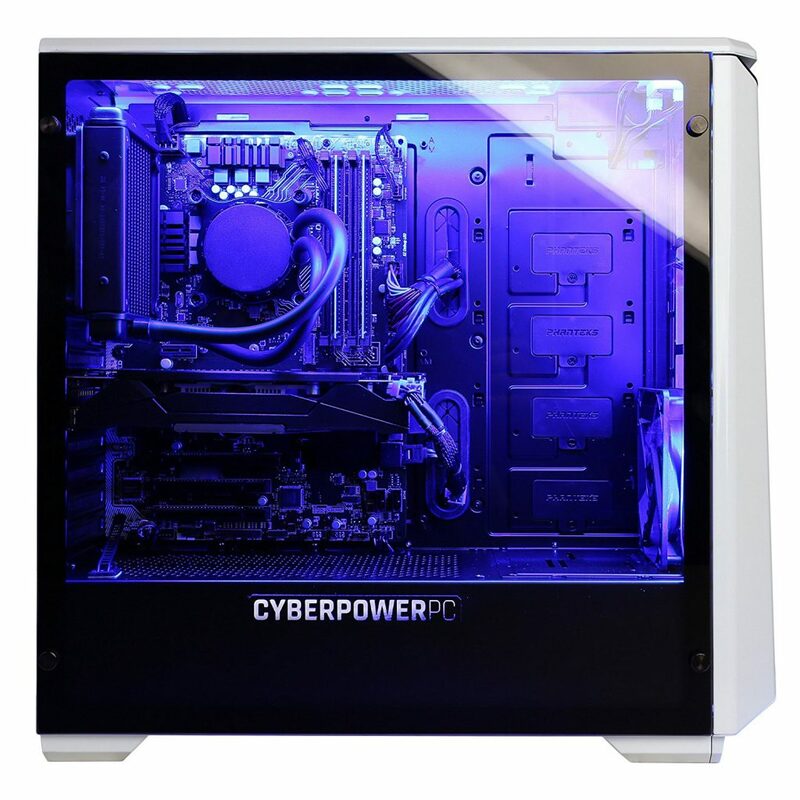 » PC Reviews » CyberPowerPC Gamer Panzer PVP3020LQ Review, Is It Entirely Worth Getting? As I said earlier, it’s a good idea to look at the specifics when it comes to each spec on these pre-built gaming PCs. For the processor this PC uses a Kaby Lake i7-7700k and it is liquid cooled. Liquid cooling adds a lot of value to the build, especially since it’s using the i7-7700k. The “k” at the end of the CPU model means that it is unlocked. You’ll be able to overclock it. Overclocking requires good cooling and liquid cooling is one of the best methods for keeping a CPU at a nice temperature. For the core CPU speed the i7-7700k runs at 4.2GHz right out of the gate. You’ll be able to increase this speed with the right overclocking method and utilizing the full potential of the liquid cooler. That isn’t entirely necessary but since everything you need for overclocking is there you might as well consider doing it, right? At its core speed you’re going to experience very fast processing speeds. With gaming in mind, Intel is still the king of single core performance. Most games today are based on single core performance and Intel still has AMD beat in that boat, though games may be changing in the future to take advantage of the hyper-threading technology. 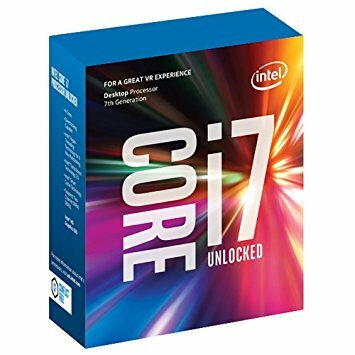 The i7-7700k has 4 physical cores and 8 threads. These threads are used when you’re doing heavy processing tasks such as rendering/editing video content. Games don’t use hyper threading technology today. Some say that it’s inevitable that game development engines in the future will be able to use hyper threading and some say that hyper threading will only be useful when it comes to content creation and what not. Personally, I don’t think it’s a bad idea to have a CPU like this because it’s good for gaming when looking at single core performance and if one were to ever spark the idea of wanting to get into editing videos or graphics rendering then they’d have the processing power to get that done. Some would say it’s complete overkill… I say that completely overdoing with performance it is better than kind of overdoing it with performance. Besides, it all comes down to how much power we’re getting per dollar spent. Let’s see if everything else adds up to this type of power. 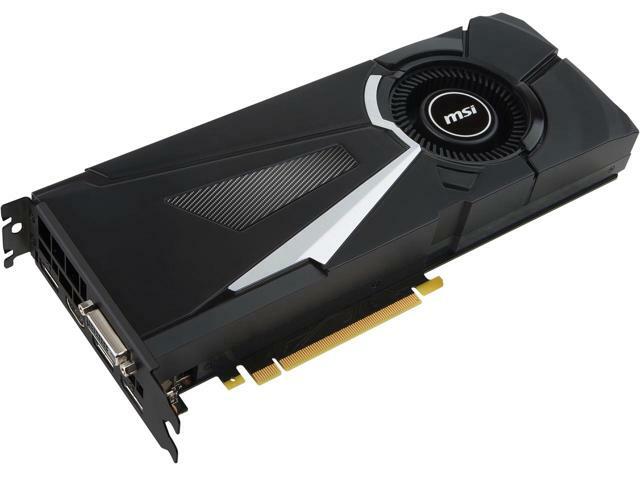 Time to talk about the most important aspect to a gaming PC – the video card. This PC uses the nVidia 8GB GTX 1080 for the GPU. This card is insanely powerful and the brand, MSI, is a very popular variant to the GTX 1080. The 1000 series cards that nVidia most recently released is made to handle all of today’s gaming at high levels of performance while also being prepared for the next generation of gaming which is in the realm of virtual reality. The 1080 specifically is going to be able to game at 4K resolution pretty smoothly and when it comes to VR gaming, it’s going to be a very fluid experience. If you take a look at performance examples on YouTube then you can see for yourself the level of performance it’s able to put out. If you’re only gaming at 1080p resolution then this card is complete overkill, you’ll max out anything that has released in the past few months with 60+ FPS… no problems at all. A card with this type of power is more so for those that are getting into VR gaming, heavy graphics rendering in different engines and/or for 1440p/4K resolution gaming. Seriously, if you plan on only playing at 1080p then you’re better off saving some money and getting something else. This PC is strictly for that level of gaming. I suppose you could stick to 1080p if you planned on upgrading to a 1440p or 4K monitor – I still game at 1080p and it’s more than enough for me. Games look great at 1080p! When it comes to the video power for this PC, you’ll be able to do whatever type of gaming you’re wanting to do. Plan on getting into VR or ultra high resolution gaming if you’re going for a PC with a GTX 1080. What About The Other Specs? The processor and video card are the two most important pieces of hardware in a PC when it comes to overall gaming performance, that’s for sure. But what about everything else? It’s not like the hard drive, RAM, peripherals and solid state drive aren’t important! Everything inside needs to equal out to the value that it’s priced at. Let’s start with the RAM. This has 32GB of DDR4 memory. That’s a crazy amount! More RAM means more multi-tasking. If you’re trying to stream, play a game and watch a YouTube video all at the same time then having 32GB of RAM is going to help make that happen. I don’t stream but I have 8GB of RAM in my current PC. I sometimes listen to music from YouTube while playing a game and I’m able to do that just fine but if I were to increase the amount of RAM I’d be able to do a whole lot more. Some people have said that adding in more RAM has helped with game performance for some titles, mainly unoptimized ones. All in all, you’re never really going to need more than the 32GB that this comes with unless you’re trying to run a plethora of servers. For hard drive space it comes with a 2TB HDD. This is more than enough room for installing plenty of games and storing different files. I have almost maxed out my 1TB HDD and I have 80+ games installed. This hard drive can double that so I don’t think you’ll be running out of room, at least not for a long while. It also has a 240GB SSD which is pretty awesome. Windows 10 will come pre-installed on it so the PC is going to boot up literally within seconds and you’ll have a little bit of room for maybe a couple of games and your most used programs. I would instantly install Steam and your other programs onto the SSD before any games. Then if you have room afterwards I would install your most played multiplayer title since load times are going to help out a lot there. There are plenty of reasons why a SSD is much faster than a HDD hence why you should install your programs and OS on it! It comes with a mouse and a keyboard as well and they’re actually not that bad. They’re both from CyberPowerPC, the keyboard has backlighting for 7 different colors and the mouse has a good enough max DPI setting (4000 DPI) to game competitively, though maybe not most optimal at 4K resolution depending on how you like to use a mouse. Down the road I’d say it wouldn’t be a bad idea to upgrade to a better mouse. Let’s also not forget the lighting feature. You’ll be able to switch the lighting inside between 10 different LED colors. The case is easy to work with, comes with 2 USB 3.0 ports on the front and you can add in more fans if you ever deemed it necessary. Is The CyberPowerPC PVP3020LQ Worth Getting? It all comes down to a few factors when you’re buying a pre-built. Remember, most pre-built PCs are a ripoff so you should always make sure that the PC you’re looking at is worth the asking price. When you look at doing a PC build of your own with the same exact specs, you’d save $100-$200 on average depending on the pricing of the parts at the time of purchase. All in all the amount of power in this build has a value of $1,500-$1,600 and this PC costs ~$1,700. If having the PC built for you and ready to go out of the box with a 1 year warranty and what not is worth the extra bit then I’d say this PC has good value! CyberPowerPC isn’t completely ripping people off here. If you’re interested in doing a build of your own to save a bit of money then I’d suggest checking out some of the guides here, they’re worth looking into! 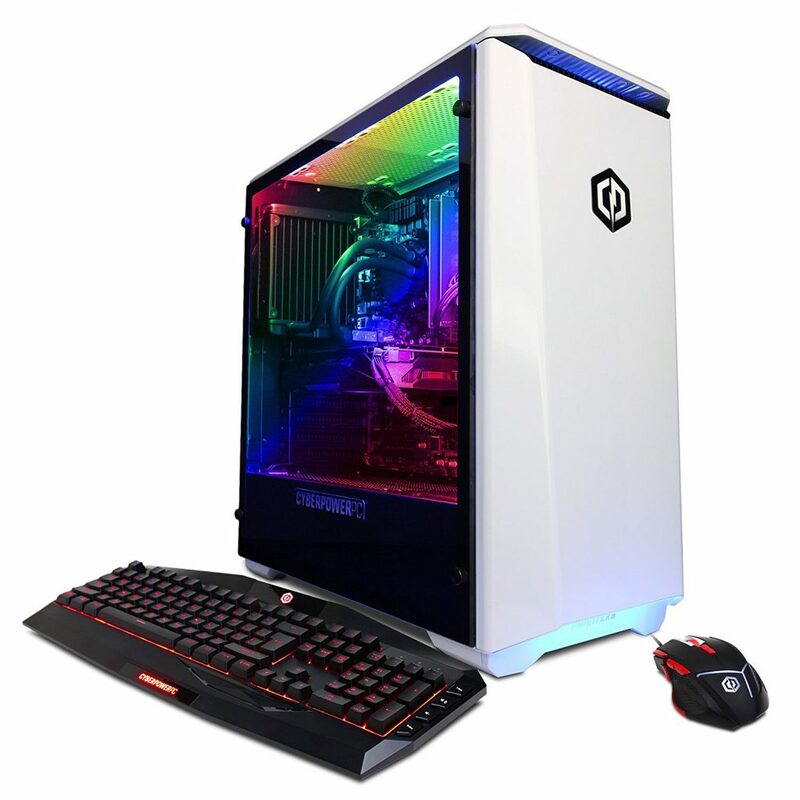 If you’re set on getting this PC then be sure to check out the reviews over on Amazon as well, it seems like pretty much everyone who has gotten this PC is extremely satisfied with it! Well, this marks the end of the CyberPowerPC Gamer Panzer PVP3020LQ review! Are you going to be getting this PC? Or are you looking into doing a build of your own to save a bit of cash? Tagged cyberpowerpc, gamer panzer, pre built gaming desktop. Bookmark the permalink. 2 Responses to CyberPowerPC Gamer Panzer PVP3020LQ Review, Is It Entirely Worth Getting? You offer an invaluable service when reviewing boxed systems vs builds. And, then take it steps further by offering build assistance. Question and suggestion for running the new Xplane 10 program. Is the above system a good way to go? Or? Although it seems it is currently unavailable, yes these specs would be more than enough for the newest Xplane. I’d take a look at some other pre-built PC reviews to see which one is going to be best for you. Always here for whatever else going forward, glad that you’re digging the site!